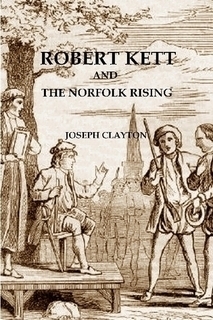 I just read "Robert Kett and the Norfolk Uprising" Joseph Clayton. First published 1912. I have read the story years ago, but reading this book brought to me just how a significant, and underplayed story this was. I don't think that it is well known outside of Norfolk. 16th Century English peasants were rebelling against a background of both religious strife, and from economic changes in agriculture - where many people were being cast aside as surplus to requirement, as land owners enclosed the old medieval communal arable fields to replace the old commonwealth with sheep pastures, that were becoming more profitable. Many English peasants were losing their livelihoods and homes, while at the same time, laws were introduced to punish the homeless poor with whipping, mutilation, slavery, and hanging. Peasants uprisings were popping up all over England, but often lacked leadership, and were easily suppressed. However, here in Wymondham in 1549, a local land owner named Robert Kett, and his brother William, sided with the rebels, destroyed their own enclosures, then joined them. Robert Kett led the rebellion to the walls of the nearby City of Norwich. At it's peak, his peasant army reached an estimated 20,000. An army to suppress them which included Italian knights was sent from London. They were beaten by the peasants, who then took control of Norwich. Kett held courts in front of an oak tree, known as the "Tree of Reformation", on a wooded hill just outside of the City, where he held his main camp. Rebels captured wealthy landlords and farmers from the surrounding countryside, and they were tried for crimes against the people. None were executed. The maximum punishment was to be gaoled in the City. It seems that Kett was quite a humanitarian for his time, and in some ways reminds myself of another Norfolk man 300 years later, Thomas Paine. A second more organised army with artillery was sent from London. The rebels withdrew from the City back to their hill camp. In the ensuing battle though, the rebels not only held, but appeared to be winning, to the point when the mayor and alderman started asking the army to leave. Then fresh reinforcements arrived from London, 1,500 Germanic knights. At the same time, desperate for resources, Kett abandoned his hill base, to fight the reinforced army in a dale on the edge of Norwich. This mistake cost him the battle. Some of the peasants bravely held out, to the point where the aristocratic general almost begged them to surrender, with personal promises of pardon. When they did surrender, he did of course, hang them, as was the practice in many suppressed uprisings in English history. Robert and his brother were captured, tried in London, then brought back to Norfolk to be executed. Robert was hung and gibbeted from the walls of Norwich Castle. William was hung and gibbeted from the West Tower of Wymondham Abbey, only 150 yards from where I now live. From a population genetics point of view, I would be interested to know just how many ethnic German and Italians were in London at this time - that their mercenaries were so available to the Crown. From a genealogical point of view, I do wonder if, or who any of my ancestors were in that 20,000 strong peasant army in 1549.